Replicative plasmids are basic tools in molecular microbiology. Many experimental approaches start with the transfer of a recombinant plasmid into the strain of interest. Cells containing the plasmid are then typically selected and maintained using an antibiotic resistance marker encoded by the plasmid, by adding a suitable antibiotic to the growth medium. For practical reasons, recombinant plasmids are usually constructed and stored in cloning strains of E. coli, then transferred (‘shuttled’) into the organism of interest in order to perform experiments. These shuttle plasmids therefore need to include all the features required for replication and maintenance in both hosts. Shuttle plasmids are often transferred by conjugation, and in these cases the plasmid must also include a transfer function compatible with the donor strain. Several shuttle plasmids have been used in Clostridium previously, each having different functional properties and host ranges. The plasmids do not share a common structure, reflecting their construction in different labs, probably without much emphasis on a design that can easily be modified. Consequently, altering these plasmids tends to require ad-hoc cloning strategies which may prove difficult and time-consuming. Furthermore, it is not possible to directly compare the differing functional properties of these plasmids. We wanted to construct shuttle plasmids most suitable for our research, but did not have data on which combination of elements would be best, nor did we have directly-comparable plasmids which would allow us to generate such data. Even if we knew which combination of elements would be most suitable, the shuttle plasmids could not be constructed quickly, reliably or in a consistent way. If our first choice of elements proved not to be suitable, or when we wished to adapt a useful plasmid for a different host or application, it was not necessarily easy to modify the plasmid, and the new combination of elements might mean an entirely new cloning strategy. Eventually we decided to invest some effort in establishing a systematic approach to shuttle plasmid construction, hoping it would save us time in the long run (fortunately, it has). 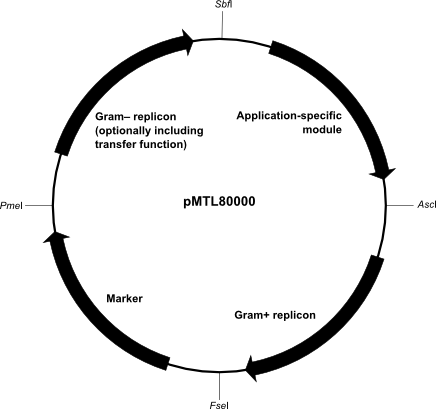 The pMTL80000 modular plasmid system was the result of this effort, and is published. Essentially, we defined a standard arrangement in which every plasmid contains exactly one module of each of four types, always arranged in the same order, and always bounded by the same four rare (8 bp) type II restriction enzyme recognition sites. The standard arrangement is shown in the plasmid diagram. We also constructed a total of 18 modules of these four types, flanked by the appropriate restriction sites. The modules are numbered, and are listed below. This system allows the combinatorial construction of shuttle plasmids from modules in the standard format. It also provides for the quick and easy modification of existing pMTL80000-based plasmids. When constructing plasmids using the existing modules no real design process is required – the researcher need only chose the desired combination of modules from the available selection. Due to the standard construction, the sequence of pMTL80000 plasmids is precisely defined by the choice of modules, so can easily be determined automatically. Plasmid names are also determined by the combination of modules: “pMTL8” followed by the numbers of the combination of modules used, in the correct order. Consequently, the short plasmid names each conveniently imply a precise sequence. To download the annotated sequence of a pMTL80000 plasmid, just select one module of each type from the menu below, then click the ‘Generate and download’ button. The annotated sequences are generated in Genbank (.gb) format. You can open these files using many molecular biology / bioinformatics tools such as GENtle, ApE and others, including some in this list. When viewing the sequences of pMTL80000 plasmids, set your software to show the following restriction sites: AscI, FseI, PmeI, SbfI, ApaI, NotI, NdeI and NheI. Once we had established the pMTL80000 system, we were finally able to generate directly-comparable data on the practically-relevant functional properties of the Gram+ replicons and antibiotic markers we use. These studies are described in the paper. Using these results and the pMTL80000 system, we (and you) can now quickly construct shuttle plasmids for particular hosts and applications using rationally-chosen combinations of modules. In order to distribute the 18 modules in a convenient way, we constructed the first five plasmids shown in the table below which, between them, contain all 18 modules. This kit, with the additional four plasmids containing each Gram+ replicon as shown in the table, is now available from CHAIN. CHAIN will oversee the distribution of the pMTL80000 series from 1st December 2015. From the kit, the other 395 possible combinations of modules can be easily constructed in one or a few cloning step(s) using AscI, FseI, PmeI and SbfI. Request a kit from CHAIN here. When we designed the pMTL80000 system and constructed the 18 modules shown here, we incorporated those elements expected to be most useful in our work. We are well aware that other useful elements exist. The current choice of modules is not intended to be definitive or static, indeed the system was designed from the start to be extensible. 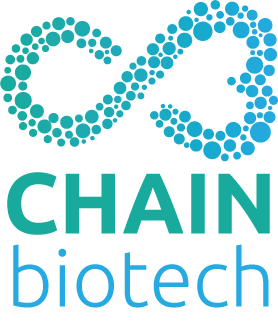 If you would like to add another useful module to the system in the correct format, and would be willing to share it, please contact CHAIN Biotech.